World #1s, World Champions, and Asian Games gold medallists are all in the top 8 as the Race to the Guangzhou World Tour Finals (WTF) enters the homestretch, with 10 of the 33 qualifying events left to be counted. 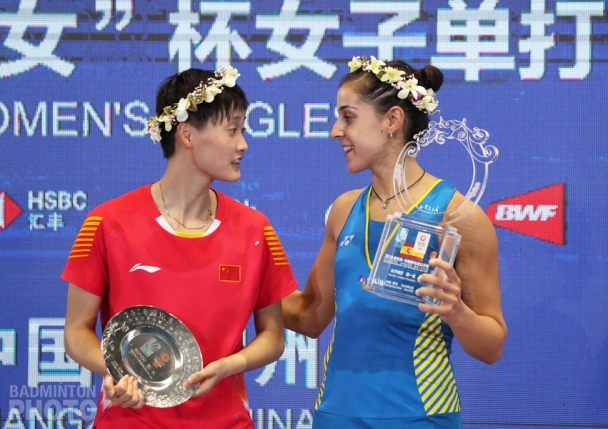 While early this year, the BWF World Tour standings seemed to feature a preponderance of players with points from Super 100 events and two months ago, only one World Champion had made it into the top 8, things are right back on track now as the Guangzhou qualification lies less than 2 months away. 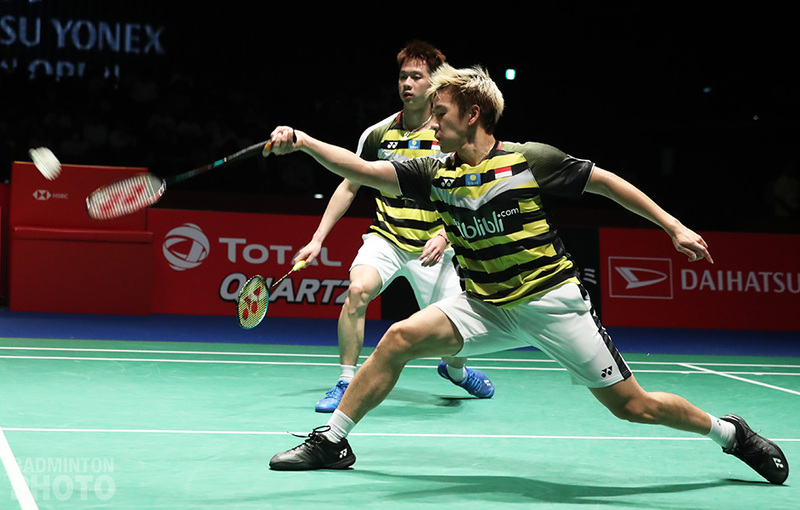 This time last year, the Superseries was two thirds over and world #1s Marcus Fernaldi Gideon / Kevin Sanjaya Sukamuljo (pictured right) had already accumulated 57,280 of the 86,830 points that would see them to the top of the table in qualifying for the season finale in Dubai. Akane Yamaguchi was yet to earn her last 33,190 points, from a maximum possible 40,400. This year, although the race to Guangzhou is even more than two thirds over, it is even more wide open than it was at this point last season. True, there is no one sitting atop the table for their discipline with only 40,000 points, as Son Wan Ho was at the end of September 2017. However, there are still 10 events left and a player who makes the most of the remainder of the tour could add a maximum of 68,700 points, a threshold that only three current qualifiers – Chou Tien Chen, Misaki Matsutomo / Ayaka Takahashi, and Zheng Siwei / Huang Yaqiong (pictured top) – have already passed. How lonely at the top? All 5 world #1 players and pairs would be bound for Guangzhou if qualifying ended today and the same goes for all five Asian Games gold medallists. 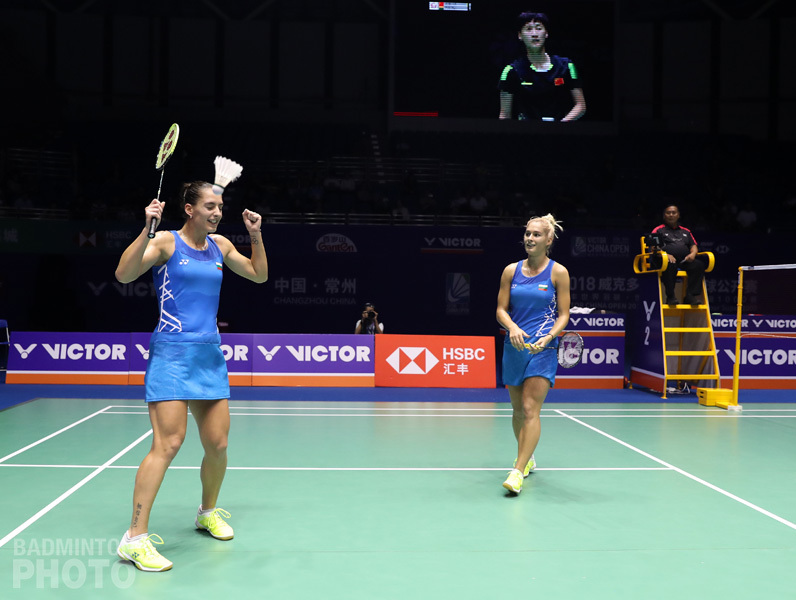 Of course, the World Champions are guaranteed of going, thanks to the BWF’s post-2014 wild card rule, but all of them would be qualified anyway, with the exception of the women’s doubles World Champions. Mayu Matsumoto / Wakana Nagahara (pictured) are in the top 8 of the WTF standings but as the last of 4 (!) Japanese pairs in that group, they would be staying home in December if not for the wild card. As for the other continental champions, Europe only has two bound for Guangzhou as things stand now. Carolina Marin’s place would look fairly secure even without her World Champion wild card but the Stoeva sisters may well lose the tight race for 12th spot (behind 1 Chinese and 3 Japanese pairs who exceed their national quota) to either Koreans or Danes because they are skipping the China and Hong Kong Opens. Meanwhile, the Bulgarians’ showdown with 2nd-seeded Fruergaard/Thygesen this week in the Dutch Open Super 100 may well end up making a difference in the end. The Danes are only 3,000 points behind and they are entered in everything left that is Super 500 or above. The only Pan Am champion with a shot at Guangzhou is Canada’s Michelle Li (pictured right). She is currently lagging behind her ‘southern neighbour’ – Zhang Beiwen of the United States – but she is the only top player who has entered all of the Super 300 and above tournaments this autumn, while Zhang is skipping Hong Kong. In women’s singles, the top 8 in the Guangzhou standings are almost identical to the world rankings, with the exception of world #8 He Bingjiao, who is well off the pace. 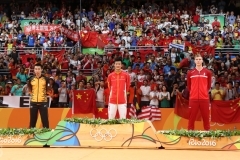 The discipline with the greatest discrepancy in the two ranking lists is men’s singles, where only Kento Momota, Shi Yuqi, and Chou Tien Chen are in the top 8 of both the world rankings and the Guangzhou tables. When the BWF unveiled its new tournament format earlier this year, a few changes raised some eyebrows. One, of course, was the fact that the Super 100 events would count toward qualification for the BWF World Tour Finals even though they were not even considered part of the BWF World Tour and instead, Super 100 had a special orphan category created for it alone, called the ‘BWF Tour’. But the more practical matter was that the Super 100 events, which are equivalent to the ‘Grand Prix’ classification of 2007-2017 and rarely attracted the regular participants of the Superseries, would be contributing points for the WTF, which is only supposed to be a showdown for the absolute best of the best. What we see now, though, is that hardly any players with points from Super 100 events are still in the top 8. 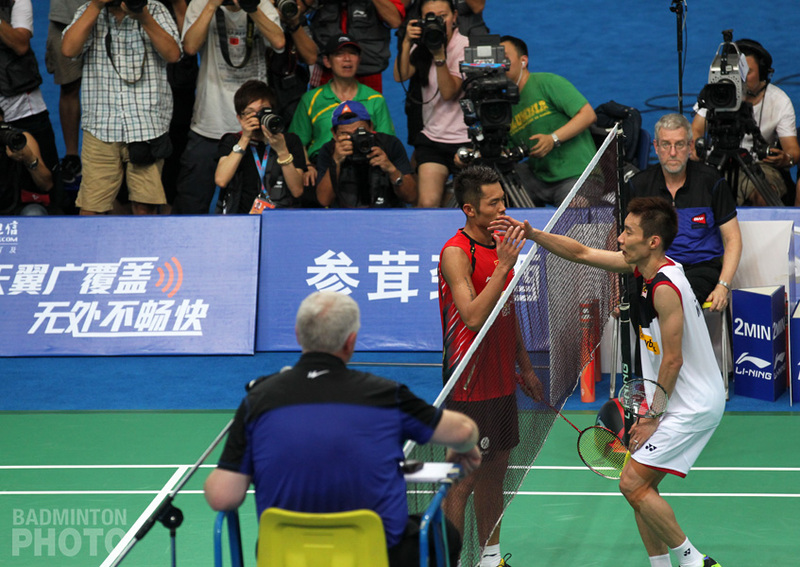 In fact, there are exactly 3 doubles pairs out of the 40 tentative Guangzhou qualifiers in all 5 disciplines. In contrast, 33 of the 40 have at least one result from a Super 300, the other ‘sub-Superseries’ category that was added to the point mix for 2018. Bulgaria’s Gabriela and Stefani Stoeva (pictured above) are playing it smart and maximizing their opportunities a little closer to home. They have played all but one of the Super 300 tournaments in Europe this year and have entered the first three Super 100 events on the same continent, adding entries as top seeds at the Dutch and SaarLorLux Opens to the Orleans Masters, which they won in the spring. If they can do well enough in Europe to make up for their absence from the big leagues in China and Hong Kong, they could still end up with an invitation to Guangzhou in December. Two young Chinese pairs also look poised to appear in Guangzhou while holding points from Super 100 events. 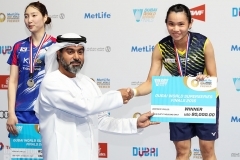 Du Yue / Li Yinhui in women’s doubles and Han Chengkai / Zhou Haodong (pictured right) each won the Lingshui China Masters and for the latter, their 3030 points from the Canada Open are helping to keep them ahead of Malaysia’s Goh/Tan in the race to Guangzhou. Obviously, if the top 8 in the Guangzhou standings are not the same as the top 8 in the world rankings, there must be some ‘lower-ranked’ players who have pencilled themselves in for the season finale, as well as top rankers who haven’t qualified. So how low do these go in the world tables? First we have to set aside the ailing Lee Chong Wei. His long hiatus due to cancer treatment has put him out of the running for Guangzhou, but while there is a lag in the effect on his world ranking, by the time the Hong Kong Open wraps up, he will be well out of the world’s top ten and will have to climb his way back up the main tables next year when he returns to action. Three other former world #1s, though, are likely to stay high in the world rankings but are well down in the WTF qualifying tables. 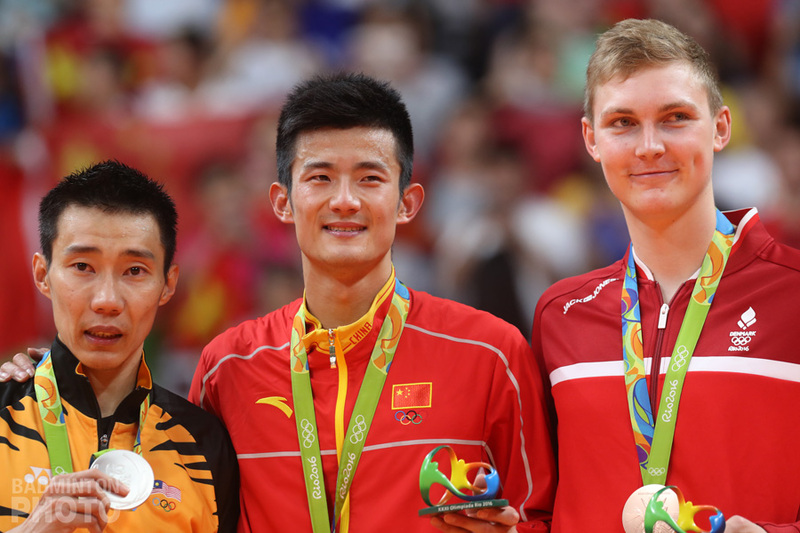 The furthest out is India’s Srikanth Kidambi. He is currently #6 in the world but there are no fewer than 27 players ahead of him in the race to Guangzhou. 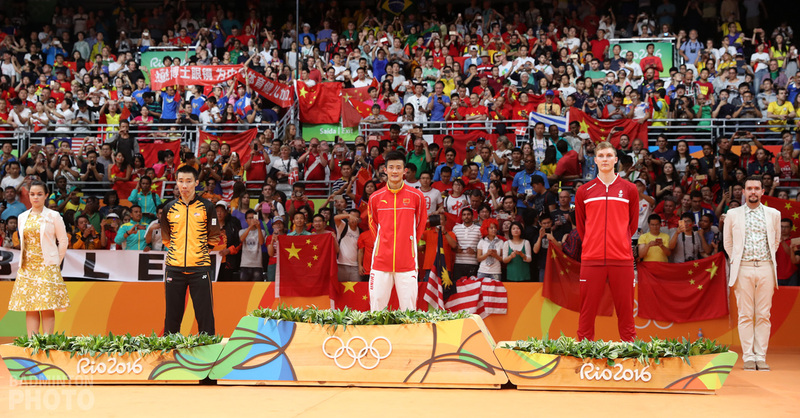 Chen Long’s situation is similar, as the world #7 is now #26 in line for Guangzhou. 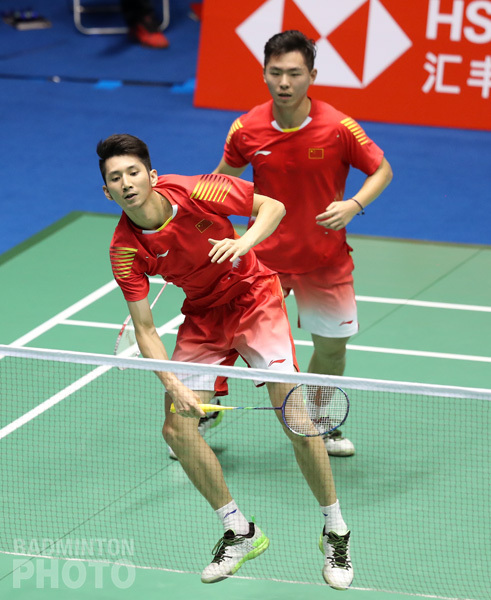 Next to Srikanth, the furthest off the pace is world #3 Zhang Nan and Liu Cheng. The former World Champions are way down at #27, and would need to earn, from the last few events, nearly 17,000 points more points than their current World Champion compatriots Li/Liu to qualify for Guangzhou. Looking at it the other way, most of the ‘surprise’ entries near the top of the WTF qualification tables are from the teens in the world rankings. The lowest ranked player in the Race to Guangzhou top 8 is Thailand’s Suppanyu Avihingsanon (pictured above). The world #21 has only been playing Super 300 events and up but he is ranked just ahead of Lin Dan at #7 and so far has about a 3,000-point cushion over chasers like Sameer Verma and Viktor Axelsen. 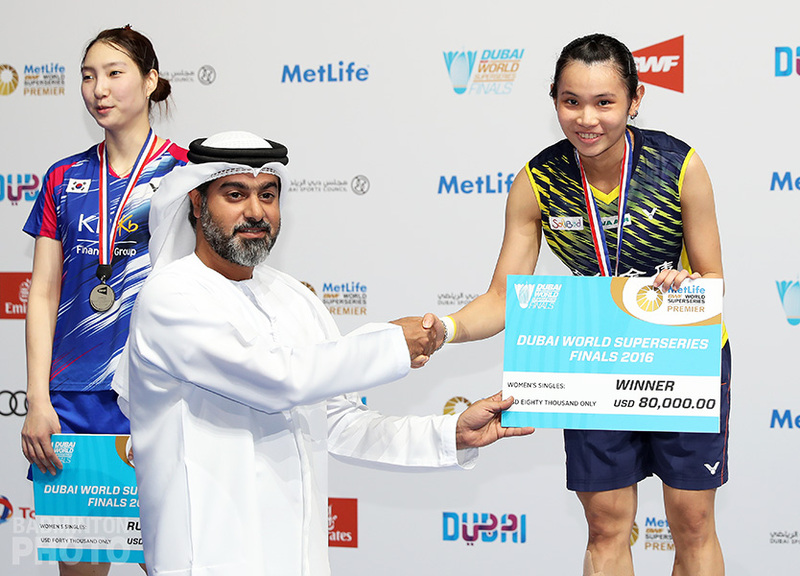 In 2017, only Chen Qingchen – winner of the doubles double in Dubai in 2016 – competed in two disciplines, defending both titles. This year, her compatriot Du Yue is the only woman close to qualifying in two. She is already pencilled in for women’s doubles but she and He Jiting are just a few hundred points off the pace in mixed. Going into the Chinese Taipei Open, Japan’s Yuta Watanabe was the only one in the top 8 twice. He has been near the top in mixed doubles for a while but the Korea Open men’s doubles title propelled him and Hiroyuki Endo up into 3rd spot and looking strong for December. Wang Chi Lin of Chinese Taipei has now joined Watanabe as the other double-tentative-qualifier. 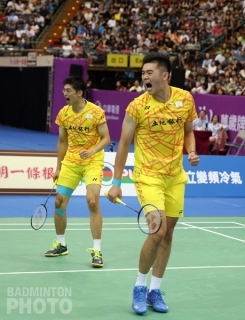 He and Chen Hung Ling (pictured right) are now a strong second in men’s doubles after their title at home on Sunday and Wang’s quarter-final appearance in Taipei in mixed puts him and Lee Chia Hsin ahead of the Asian Champions and into 7th spot, with nearly a 4,000-point advantage over their nearest challengers. The new Race to Guangzhou qualification tables – complete with points from the Chinese Taipei Open – will be available from the BWF on Thursday at this link.